There's only one thing that's happening on April--the royal wedding of Prince William and Kate Middleton. So Elaine, my magazine's associate features editor, who's been doing research, shared with us the video of Diana's long march down that aisle so many years ago. Confession: I've never actually watched this most famous wedding before! It took my breath away. Did you hear the people roar? Did you hear the trill and bellow of the trumpets? I got goosebumps honestly. I imagine a saint's arrival at heaven to be greeted like that, with applause and trumpets. In her voluminous dress, Diana still looked very elegant and beautiful, even brave. Well, every person about to get married has to be brave! My own wedding was very simple. So was Vito's baptism. Vince and I aren't the pomp-and-pageantry type. We like to dress up and eat well, but we don't like programs or dance numbers or long speeches or giveaways and stuff like that. For a lot of people, events are a big show (and there's nothing wrong with that!) but for Vince and me, our events are very private and quiet. But watching Diana's wedding, I can't help but feel that weddings should indeed be like that--a spectacular show! I certainly now wish my wedding march had been accompanied by such fanfare! Drums and trumpets and the thunderous roar of thousands of happy people! Hear! Hear! Eeeee! I love how everyone cheered as soon as they saw Diana! She looked so nervous, walking down the aisle. And even once she let go of the flowers, she was clutching at her stomach. Butterflies? I wonder what Kate's wearing? I imagine her in something sleeker, but a less pouff-y dress might get overwhelmed by such a big venue. Liv!!! Why did you do this to me??? Now I have to have that bag!!! And it's just $150! =D Thanks! RoSe, teehee, Betamax! Those were the days! Yes, her arrival was so fabulous. Grabe. That wedding changed an entire generation's idea of weddings! Tisha, I know! Goosebumps, diba? Anyway, I also hope Kate will wear something that won't get swallowed up by such a huge occasion. She's obviously a sleek dresser. But sleek won't cut it in Westminster! 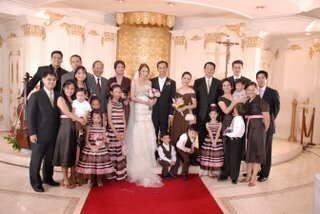 Hi Candz, yes, there was a twinge of "wow, bongga that wedding!" but I am really very happy with my wedding, how simple everything was. In fact, though we were very happy that day, Vince and I didn't have the wedding we wanted--if we had our way, it'll just be me, him and the minister. What we had was a wedding that appeared on society pages and wedding magazines! So lovely but funnily enough, so not us! We're still planning a private wedding! But now kasama our son Vito. He'll be our ringbearer! P.S. Cool wedding march song! i love how ladies wore hats! ang fasyon lang talaga!! lovet!! gusto ko nakafascinator naman lahat ng girls pag sakin tuloy! Shen, invite mo ko sa wedding mo pleeeeeeease! I want to wear a hat!